This is what you've been waiting for! 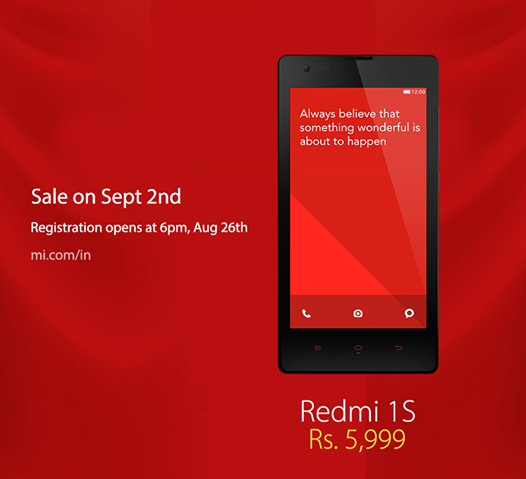 Redmi 1S will be available for sale on 2 September at Rs. 5,999! Xiaomi's Redmi 1S is powered by a 1.6GHz quad-core Snapdragon 400 SoC, coupled with Adreno 305 GPU and 1GB of RAM. It has 8GB of built-in storage that is expandable via microSD card (up to 32GB). The Redmi 1S also features an 8-megapixel rear autofocus camera with flash, alongside a 1.3-megapixel front-facing camera. The Redmi 1S comes with 3G, GPRS/ EDGE, Wi-Fi 802.11 b/g/n with Direct and hotspot functionality, Micro-USB, Bluetooth 4.0, FM radio, GPS/ A-GPS, and USB OTG connectivity options. It is powered by a 2400mAh battery, weighs 158 grams, and has dimensions of 137x69x9.9mm. The company has also announced accessories for the Redmi 1S, with screen protectors (matte and clear) priced at Rs. 179, a flip cover at Rs. 559, back cover in colours at Rs. 459, and a silica gel cover at Rs. 359. Considering the phone's price tag, it is likely there will be an enthusiastic response to Redmi 1S, and it will be interesting to see if the smartphone will be plagued the kind of stock shortages that have become synonymous with the Xiaomi Mi 3 in India. The dual-SIM (Micro-SIM) Xiaomi Redmi 1S with dual standby was first announced for China in May, and features a 4.7-inch 720x1280 pixel IPS-LCD display with Corning Gorilla Glass 2 protection and a pixel density of roughly 312ppi. It runs on Android 4.3 Jelly Bean with MIUI v5 skinned on top. The company has promised an upgrade to Android 4.4 KitKat with MIUI v6 towards the end of the year.